As the international education industry continues to expand and mature worldwide, one of its distinguishing characteristics is increased, even intensified, competition. Competition from a growing field of schools and agents, from new and emerging destinations, and from entirely new business models and types of competitors. How to distinguish one’s school or agency within that increasingly crowded field is an ever-more pressing question for international education leaders today. And that brings us back to the importance of branding, and establishing an effective brand platform for your organisation. The topic was squarely in focus at the recent Eaquals International Conference in Lisbon, where Janet Galbraith led a seminar that explored some important concepts in brand identity. Ms Galbraith is the principal of CES Edinburgh, the newest school in the Centre of English Studies portfolio. As this point illustrates, you can understand brand identity as an interaction between what you say your brand is, how customers or stakeholders experience your brand, and what those customers say your brand is. This is well beyond the realm of logos and brochures. Rather, it is a set of values and ideas – an organisational philosophy or ethos – that underpins and informs everything that you do. A well-articulated brand identity is something that everyone within the organisation can relate to and engage with. It can be readily understood by your customers, and it can set you apart from your competition. It reflects your values, how you communicate those inside and outside of the organisation, and how you want customers to feel when they engage with your business. To help make the concept more concrete, Ms Galbraith brought forward a widely used conceptual model in her Lisbon seminar: Jean-Noel Kapferer’s Brand Identity Prism. Mr Kapferer is a globally recognised branding expert, and a Professor Emeritus at HEC (Hautes Etudes Commerciales) in Paris. He first introduced his brand identity model in his noted 1996 book Strategic Brand Management. The Kapferer model is also interesting in that it ties together both internal and external aspects of the brand, as reflected in the following illustration of the Brand Identity Prism. There are some core concepts at work in this model, including the notion that a well-articulated brand has to be able to be seen as a person. 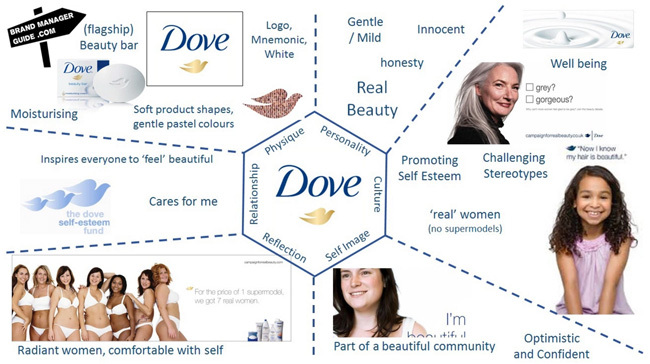 This is reflected in the model above by the “constructed source” aspect of the model; it includes elements such as “physique” (the physical characteristics of the brand) as well as “personality” (the style or tone of the brand). The model also requires that the brand has to reflect a typical customer, as indicated above in the “reflection” and “self image” elements. In addition to this highly personal and personified idea of brand identity, Kapferer also divides his model into internal and external aspects. “Externalisation” elements are those social aspects of a brand that shape its external expression (these include the “physique,” “relationship,” and “reflection” elements as indicated in the model above). “Internalisation,” meanwhile, integrates a number of intrinsic elements – “personality,” “culture,” and “self-image” – that underpin the brand. Each of these elements comes into play when a brand engages or communicates with a customer, through marketing activities or through the customer experience of the brand. To bring these ideas down to earth a bit more, let’s take a closer look at each in turn, and at some examples of how this model applies to major brands. Physique is the physical aspect of the brand. It includes the logo, colour palette, distinctive packaging or setting, and flagship product. Ms Galbraith highlighted the example of Starbucks Coffee in her presentation, noting that the brand identity was highly recognisable but also that the physical experience of the brand (cafe decor, seating, presentation of products, etc.) was remarkably similar in its locations around the world. Personality is the character of the brand. It reflects in particular how the brand communicates with the outside world, via a certain tone or style or even through a spokesperson who is strongly associated with the brand. Culture reflects the values and ideas on which the brand is based. This may often be tied to the brand’s country of origin – for example, Coca-Cola’s expression of American values or Mercedes-Benz’s strong connection to German culture – or to other founding ideas to which the company is strongly attached. Relationship is what the aspects of connection that customers feel they get when they engage with the brand. This goes beyond the transaction itself and ties more to ideas of family relationships, community, and service. 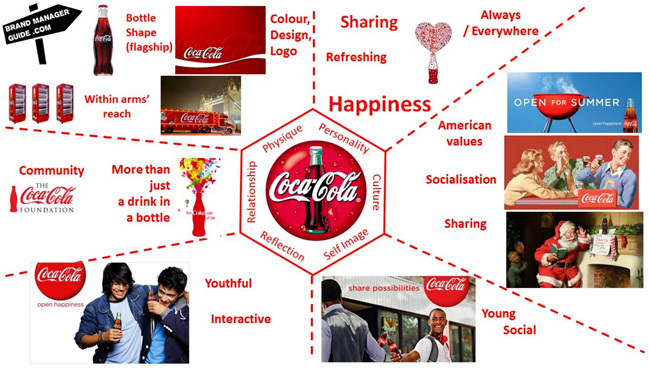 Coca-Cola, for example, emphasises equal and friendly relationships in a sharing community. Self image is the mirror that your target customers hold up to themselves – that is, it reflects their ideal self back to them. Nike customers, for example, may want to see themselves as active, determined, and athletic, whether or not they currently maintain an active lifestyle. These concepts are further illustrated in the following applications of the Brand Identity Prism for Coca-Cola and Dove produced by Brand Manager Guide. With these examples in mind, can you imagine how you could begin to apply the Kapferer model to your company or institution? It stands to be a fascinating and worthwhile exercise and, if thoughtfully conducted, you can easily imagine how your own brand prism could carry through to day-to-day operations. How, for example, it might inform your marketing strategy or even the messaging and style you use in your promotional material and online communication channels. Or how it could influence how you continue to develop your programmes and services for students. And here we come to a key concept that needs to connect with any branding exercise: the brand identity must be strongly connected to the actual experience that customers have of your brand. A well-articulated brand identity is not the end of a branding process, nor is it a complete brand platform in and of itself. It is, however, a valuable foundation for your brand, one that needs to be consistently expressed in how you conduct yourself in the marketplace, how you relate to competitors, stakeholders, and customers alike, and, at the end of the day, how customers experience your product or service. To revisit the Jeff Bezos quote from earlier, how do you want your customers to talk about you, or feel about you for that matter, when you are not in the room? This entry was posted in Africa, Asia, Australia/Oceania, Europe, Marketing, Middle East, Most Popular, North America, Regions, South & Central America and tagged Most Popular, universities with international students, student enrolment, vocational schools abroad, online marketing.